Anti Tobacco Jar. Buying toys online has never been easier, peruse around all of our deals and products and find the latest toys online. Candle Height : 83 mm. Candle Weight : 349 grams. Price's Patent Candles Ltd started in 1830 and have been trading ever since in the UK. High Quality Odour Eliminating Tealights from Prices Candles. Contain extracts of oranges and cloves. Contain odourfoyl a fragrance system which effectively renders malodours undectable. Eliminates TOBACCO odours. 18 scented tealights(3x6). Eliminates Odours. 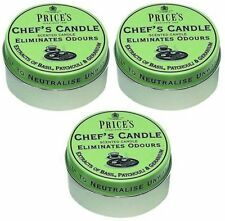 Price's Fresh Air Scented Tin Candle. Anti Tobacco. Never Leave A Burning Candle Unattended. Don’t burn candle on or near anything that can catch fire. Do not move a burning candle. Simple to set up and easy to use. Household Tin. Candle Height : 40 mm. Buying toys online has never been easier, peruse around all of our deals and products and find the latest toys online. Candle Weight : 119 grams. We are very professional and make the whole process a seamless one, so if you are looking for gifts, toys or essentials for your little one, you are in the right place. Anti tobacco candles contains extracts of orange and cloves. Eliminates Tobacco and Smoking Odour. 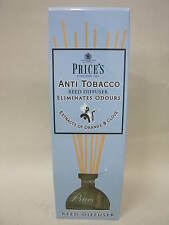 2x Price's Anti-Tobacco Candle in Jar. From Britain's leading candle maker, Price's. Candle Height 83 mm. 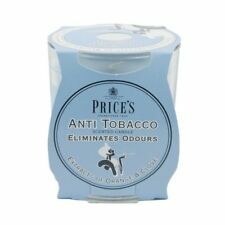 This candle from Price's help to neutralise unwanted odours especially when from tobacco / smoking. The Anti Tobacco candle contains extracts of Orange and Clove. Functional and decorative in a jar. Candle Height : 83 mm. 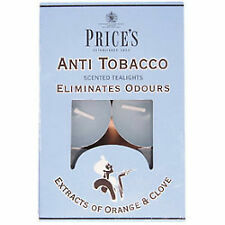 This candle from Price's help to neutralise unwanted odours especially when from tobacco / smoking. The Anti Tobacco candle contains extracts of Orange and Clove. 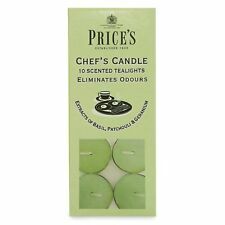 These candles from Price's help to neutralise unwanted odours in the household. 16 Candles in total. Eliminates Odours. Contains Odourfoyl to neutralise unwanted household odours. Price's Fresh Air Scented Candle. Anti Tobacco. In glass Jar. Never Leave A Burning Candle Unattended. Do not move a burning candle. Each scented tea light candle contains Odourfoyl. The candles themselves contain extracts of oranges and cloves and are light blue in colour. The candles themselves contain extracts of oranges and cloves and are light blue in colour. Extracts of Orange & Clove. Anti Tobacco Candles. Contains odourfoyl to neutralise tobacco odours. 2 xPRICE'sAnti Tobacco Tealight Candles. 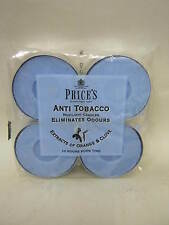 to neutralise unwanted tobacco odours. This Price's Tinned Scented Candle will help eliminate odours when lit. Price's candles is one the finest scented candle makers in the world and is based in the UK. 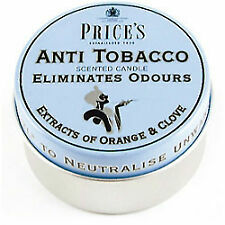 Price's Anti Tobacco Scented Candle in Tin. This candle form Price's help to neutralise unwanted odours. Anti Tobacco candle contains extracts of orange and clove. 30 hours under ideal conditions. Each scented tea light candle contains Odourfoyl. The candles themselves contain extracts of oranges and cloves and are light blue in colour. 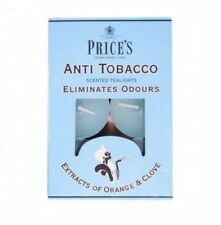 Prices Anti Tobacco Scented Candle. Eliminates odours. Search our full range. High quality products at amazing prices. You won't find cheaper prices anywhere! Dedicated Support. One Supplied. Contains Odourfoyl to neutralise unwanted household odours. ELIMINATES TOBACCO ODOURS. 12 PRICES ANTI TOBACCO TEA LIGHTS. Anti Tobacco Scented Tea Lights. Each scented tea light candle contains Odourfoyl. Odourfoyl is a uniquely designed fragrance system, which effectively renders malodours undetectable. The candles themselves contain extracts of oranges and cloves and are light blue in colour. Eliminates Smoking Odours. The Tealight Should Be Lit On A Suitable Tealight Burner. Prices Scented Anti Tobacco Tealight Candles. Guidelines & Warnings Once The Tealight Is Lit Do Not Move Or Touch It.